Take action to stop these violations of the International Code of Marketing of Breast-milk Substitutes. The people responsible have names and addresses - call on them to market their products ethically. Will UK companies stop breaking the law? Click here to download the campaign sheet as a pdf file. Note: Nestlé has just spent a fortune launching a 'shared value' report boasting of its "positive impact on millions of people across the world" - click here. Can you send us a few pounds to help us to expose Nestlé's marketing practices and stop violations of the marketing requirements? The South African Government is conducting a consultation on new regulations for the marketing of infant and follow-on formula and other baby foods. Click here to jump straight to the form to send a message. International comments are being accepted until nearly the end of April. The regulations will help to stop aggressive marketing of these products by Nestlé and other companies and have much to commend them. The South African Government needs support to ensure the regulations are not weakened. In the past the industry has argued that it should be allowed to advertise infant formula, claiming 'freedom of commercial speech'. Nestlé is treating current regulations with contempt - with the backing of a UK Member of Parliament (Tom Levitt) - so the new regulations are important to strengthen the action the authorities can take. Baby Milk Action exposed on the March 2008 Campaign for Ethical Marketing action sheet how Nestlé had promoted infant formula using shelf talkers. These featured new labels claiming that the formula 'protects'. The International Code of Marketing of Breastmilk Substitutes prohibits the advertising and promotion to the public of all breastmilk substitutes, including infant formula and follow-on formula. According to the Department of Health, Nestlé has been reminded that shelf talkers come within this prohibition. “This allegation is incorrect and the Advertising Standards Authority of South Africa has, in fact, already ruled that this advertising did not contravene any advertising restrictions. Mr Brady’s final allegation that the health claims on the Nan labels are non-compliant is also incorrect as the health claims fully comply with the South African regulations that apply to this product.” [emphasis added]. However, there is no such ruling amongst those published on the ASA website. Nestlé was asked to provide a copy and, though it replied to Baby Milk Action's letter, did not do so. [Update: after writing to Nestlé three times, the company did provide a copy of the ruling. This self-regulatory body does indeed find for Nestlé, contrary to the position of the Department of Health. The complaint to the ASA was brought by the Infant Feeding Association - Nestlé's competitors - who were trying to stop it driving down standards]. 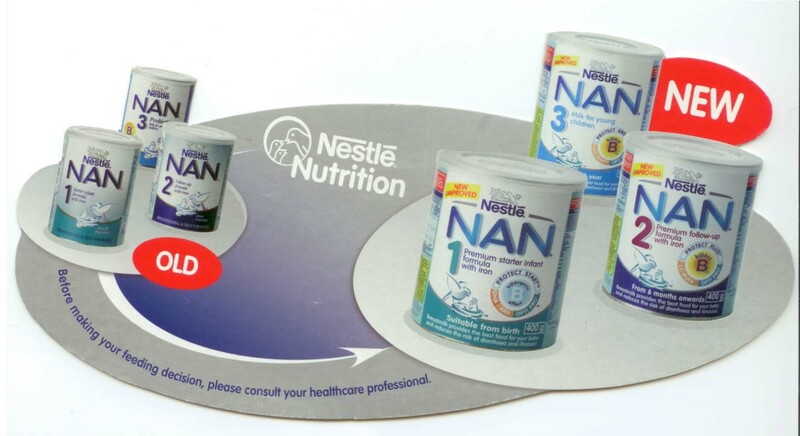 "The Department of Health are extremely concerned about all the health claims that Nestle make on the new NAN 1, 2 and 3 tins. The health claims are a contravention of the current South African Regulations. A meeting was held with representatives of Nestle and Department of Health and it seems they were not aware that they are transgressing the Regulations. However, they are reluctant to change the labels." Despite this Nestlé told Baby Milk Action in a letter dated 2 April 2008 that the labels are "in accordance with current labelling standards". Member of the UK Parliament, Tom Levitt MP, went to South Africa at Nestlé's expense in February 2008 and subsequently praised the company for complying with the marketing requirements and suggests its malpractice is from 30 to 40 years ago. When the shelf talkers were brought to his attention he posted an article on his blog claiming: "Tom accepts the company’s explanation as being consistent with what the MPs saw and heard in South Africa." Presumbably Mr. Levitt's investigation did not include speaking with the authorities in South Africa. Mr. Levitt repeats Nestlé's explanation on his blog, including: "Mr Brady’s final allegation that the health claims on the NAN labels are non-compliant is also incorrect as the health claims fully comply with the South African regulations that apply to this product." "The SA Regulations 2 (9) (b) & (c) of the Regulations Governing the Labelling and Advertising of Foodstuffs, published under Government Notice No. R. 2034 of 29 October 1993 strictly prohibits health/curative/restorative/prophylactic/medicinal claims. "Therefore, statements such as "optimal physical and mental development", "activate your baby's immune defences" and "strengthen your baby's natural defences" as indicated on the labels are just some examples of prohibited statements on NAN 1 and 2". Such promotion and claims are illegal in Mr. Levitt's constituency, so it is disappointing that he is defending these practices in South Africa and undermining the Department of Health's position. It is also disappointing that Mr. Levitt praises Nestlé for high standards, when the shelf talkers are a violation of the company's stated policy. Baby Milk Action conducted a poll on this website and 100% of respondents agreed Nestlé's shelf talkers are a violation of the Code. While dismissing other evidence out of hand, Mr. Levitt has neither replied directly to Baby Milk Action nor accepted an invitation to meet. 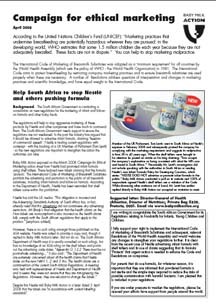 Click here to download our briefing on Mr. Levitt's campaign of support for Nestlé. If Mr. Levitt has written to you about Nestlé feel free to contact us so we can check any new claims. Click here to open the suggested email in your email programme. Feel free to adapt as you wish. You may wish to add information of where in the world you are writing from and your interest in this issue. Letters sent by post should be addressed to: Director-General of Health (Attention, Director of Nutrition), Private Bag X828, Pretoria, 0001. At the end of 2006 the UK Food Standards Agency wrote to baby food companies reminding them that only claims specifically referenced in the UK Infant Formula and Follow-on Formula Regulations may be used on labels. Claims such as "with prebiotic care" and "closer to breastmilk" are not on the list. Companies issued new labels, but again used claims that are not permitted. Updated regulations were introduced in 2007. The baby food industry took the government to court to delay the deadline for complying with the new labelling requirements. Baby Milk Action submitted evidence to the High Court arguing that delay was a pointless exercise as companies already had to change labels that broke both the old and the new laws. The industry won the case. We continue to argue that it should remove the labels that break the law and are calling on the authorities to force them to do so. LACORS, the umbrella body for Trading Standards officers, responsible for enforcing the law, has agreed to accept quarterly monitoring reports produced by Baby Milk Action on behalf of the Baby Feeding Law Group, a coalition of 22 health worker and mother support groups, about these and other issues. While it is important to stop follow-on formula advertising being used to promote infant formula, the review is far too narrow. The government is consulting on the review and you can ask for it to be broader. At the same time, you can write to the companies calling for them to remove illegal formula labels. Click here to open the suggested email in your email programme, or enter your details below and submit the form. Feel free to adapt as you wish. You may wish to add information of where in the world you are writing from and your interest in this issue. I am contacting you to ask that you immediately make changes to the labels of infant formula and follow-on formula in the UK to remove all text that idealizes these products. In particular, as you are well aware, health and nutrition claims are only allowed if specifically referred to in the annexes to the Infant Formula and Follow-on Formula Regulations. These do not allow claims such as 'prebiotics', 'inspired by breastmilk', 'new improved protein balance' etc. etc. I also ask that you warn parents that powdered formula is not sterile and give the information on how to reduce risks as set out by the Food Standards Agency. Images such as teddy bears and babies also idealize the product. Please confirm you will remove these. Click on the company name to open their comments page or use the email address if given. Please contact us if any links die or emails bounce. Aptamil, Cow & Gate, Milupa (parent company Danone). Danone UK, PO BOX 4261, Reading, RG8 9ZZ, UK. H.J. Heinz Company Limited, South Building, Hayes Park, Hayes, Middlesex UB4 8AL, UK. HiPP UK Ltd., 165 Main Street, New Greenham Park, Newbury, Berks, RG19 6HN, UK. SMA Nutrition (parent company Wyeth). Wyeth, Huntercombe Lane, South Taplow, Maidenhead, Berkshire, SL6 0PH, UK. You can be a Code Monitor.